On June 3, 1945, Corporal Susumu Sasaki took off from Chiran Air Base and died in a special (suicide) attack west of Okinawa at the age of 19. He was a member of the 214th Shinbu Special Attack Squadron and piloted an Army Type 97 Fighter (Allied nickname of Nate). After his death in a special attack, he received a four-rank promotion to Second Lieutenant. He was from Shimane Prefecture and was a member of the 14th Class of the Yonago Pilot Training School. I trust that everyone in the family is in high spirits. The south of Kyūshū is blazing with new green leaves, and it is indescribable scenery. Today I will make a sortie in high spirits. I certainly will hold my own. Please rest assured. When I think about it, the period of twenty years  after having been born into this world seems long but was a short number of years. Up to today I have not given you relief. Please forgive me. As for full details, please hear them in a letter from my maintenance worker. You must be busy with rice planting. Father and Mother, take sufficient care of yourselves. I pray for your health. I will crash dive at 1300 on June 2. Farewell. The letter and poem come from Chiran Kōjo Nadeshiko Kai (1996, 115-6). 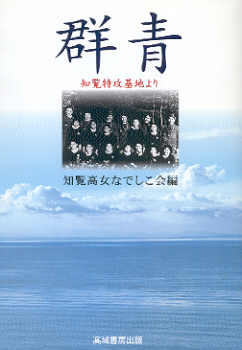 The biographical information in the first paragraph comes from Chiran Kōjo Nadeshiko Kai (1996, 115), Chiran Tokkō Irei Kenshō Kai (2005, 198), and Osuo (2005, 206). 1. The traditional Japanese method of counting age, as in much of East Asia, regards a child as age one at birth and adds an additional year on each New Year's day thereafter. This explains why the letter indicates his age as 20 whereas the current way of counting age indicates that his age was 19 (Chiran Tokkō Irei Kenshō Kai 2005, 198) at time of death.